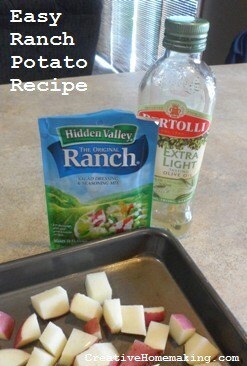 I wish I would have discovered this ranch potato recipe a long time ago. It’s so easy! My cousin prepared it for us one evening when we went to their house for dinner, and I had to get the recipe. These potatoes go well as a side dish with just about anything. You can serve them with chicken, pork chops, fish, or steak. To prepare them you only need three ingredients. I will not give you exact measurements, because it depends on how many people you are serving, and the measurements don’t have to be exact. Depending on the size of the potatoes, I plan on approximately two or three potatoes per person, depending on the size of the potatoes. Preheat oven to 400 degrees. Wash and scrub the potatoes. There is no need to peel the potatoes, just cut off any brown spots and chop the potatoes into small cubes. Spray a cookie sheet (one with rims on the sides) with cooking spray. Arrange the potatoes on the cookie sheet. Sprinkle the ranch seasoning mix evenly over the potatoes. I only use half a package when making potatoes for four people. Drizzle olive oil over potatoes and place them in the oven for approximately 45 minutes, a little less for fewer potatoes, and a little more for more potatoes. The potatoes will be nice and brown. You might want to check them after approximately 30 minutes and stir them around a bit to get them browned on all sides. Although you have to wait a little bit for these potatoes to bake, they are very easy to make and well worth the effort! Like this recipe? You might also like to learn how to bake potatoes for a crowd.